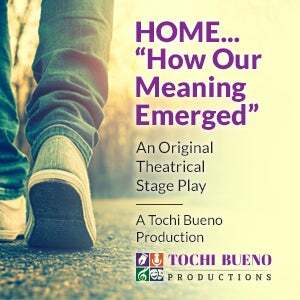 HOME - "How Our Meaning Emerged"
HOME... “How Our Meaning Emerged” is an original Tochi Bueno Production from the talented playwright who brought you “RSVP” last year. TBP is pleased to bring you another phenomenal production about individual stories that seem to be disconnected, but they are all a part of a bigger story. Everyone is searching for a place where they belong. Sometimes we don't realize just how connected we are until we make it HOME. HOME is not just a familiar space, but it can be a sweet scent, a warm touch, a merciful gesture, or a missing piece finally in place. There is a place where in spite of the periods of unhappiness, uncertainty, and unrest in our life we can still rise above because love is still stronger than hate and light is still able to drive our darkness. HOME awaits each of us. The difference is how our meaning emerges. Journey with us HOME through heart tugging tales, poetry, and song –embrace yours and know you are not alone.